Twenty years ago this map would have been blank, how will it look twenty years from now? Jarrett Walker at Human Transit thinks Los Angeles is the transit city of the moment and that planners across the globe should keep their eyes on what the region is doing to change its world-renowned image as the capital of car culture. 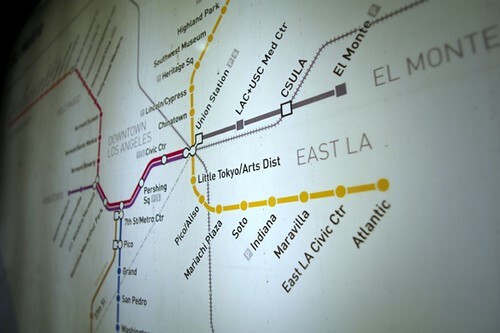 What excites Jarrett most is L.A.’s potential to transform itself thanks to an urban geography that is conducive to good transit and a new found consensus among citizens and government about the need for transit. While conceding that there are many problems and hurdles to be crossed, Jarret makes an excellent point: on a micro level almost any transit system exhibits flaws and Los Angeles is no exception, but when looked at as a whole L.A.’s efforts to bring transit back to the city where the car is king is nothing short of awe inspiring. The results are in from a new poll conducted for Transportation for America and the conclusion is clear: the majority of Americans want an improved transportation system. According to the poll 59% of respondents said public transportation needs to be improved in order to reduce congestion. I always have a problem with the idea of “reducing congestion” with public transit – it seems to appeal to auto drivers who might never step foot on public transit but would vote for anything that might reduce traffic, even if it really wont. I believe public transit isn’t about “reducing congestion” but having an “alternative to congestion”. The good news is that the poll also found that 66% of respondents expressed the desire for more transportation options for themselves. San Francisco MTA has just completed a huge and unprecedented task: counting every public parking space in the city. The final tally? There are 441, 541 public parking spots in San Francisco – this number includes on-street and garage parking. That’s a lot of space devoted to storing – often for free – privately owned vehicles. According to Streetsblog, the space used by on-street parking alone is equivalent to the area of the Golden Gate Park (1,017 acres, check out this Google Map for how that scales in the city).